Luke Langholz Pottery: Post-Show Review and Such. Hey! Thanks to everyone who came out to see me at the Zonta Craft Sale this (last) weekend! The weather turned sour Saturday afternoon and remained icy through Sunday, but plenty of souls still braved the elements to support local artisans (and other vendors and such...). This was definitely one of my better shows in terms of feeling prepared beforehand. Everything went smoothly, and I tried out a new-ish configuration for my booth setup that was kind of exciting. Setting up the night before. I normally keep my booth space open, rather than closed, but with the way this show was configured that would have left me no room for getting behind the display to pack up purchases, go through stock, etc. - I would have had to do that in the aisles. So I rocked the "Closed L" display this weekend, which worked out pretty well. I ended up with a bonus table inside of my L-shaped booth area, so I used it as a dedicated wrapping/packaging space which was a welcome change from always doing that stuff from under a table in the back of the booth. My view throughout the weekend. 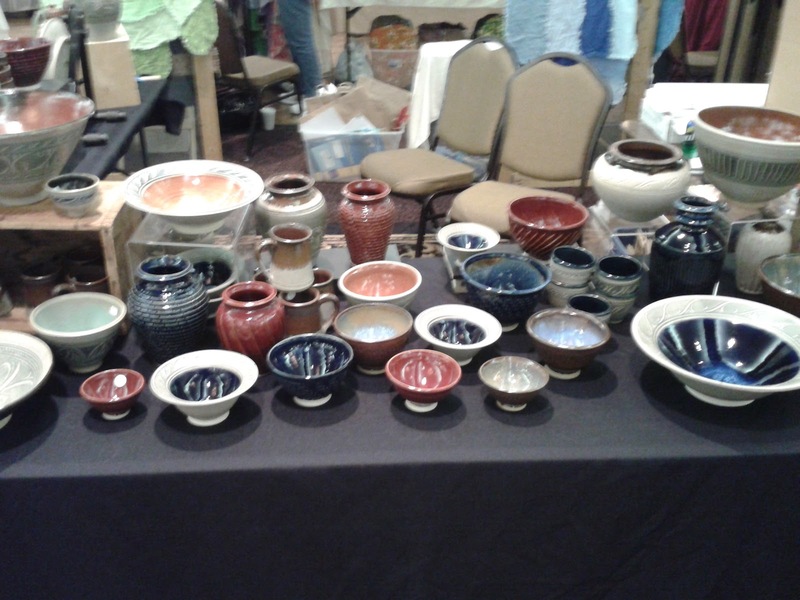 I of course had more pots than I possibly could have sold over the course of one weekend (and if I had - how awesome would that have been?! ), and the new checker/brickwork pieces were quite popular, if I may say so. I have, of course, plenty of work available now to fill any Christmas orders you lovely people may have. It also turned out to be, in very subjective terms, a very fun sale for me. Lots of chatting with friendly folks and sharing about my work and techniques and stylistic choices. Above average crowd by that measure, actually. Had to relocate that large mountain vase to place this large bowl. Still looking for a home for that one. I've realized I may have to adjust certain aspects of my display with regard to marketing my name and brand and such, specifically when I'm doing shows like this that are not quite on the "fine art and craft" side of things, in that for every artisan (potter, painter, jeweler, photographer, woodworker, baker) there was at least one, maybe two booths of retail/resale vendors. Which is great. It creates an environment full of products at all price points and attracts shoppers who may not come to an exclusively "art" oriented show. I'm always amazed (aghast? surprised?) when the first question a person asks me, looking at my display, is if I made "all this." No, wait. The question, usually, is: "So where do you get your pots from?" To which I respond I make it myself, and THEY are amazed (aghast? surprised?). It's just not something I would ever question. My name is on the cards, my name is on the pots. But what I assume is sort of beside the point if it's a matter of uncertainty. I certainly do my best to take these questions courteously and try not to make anyone feel bad for asking the question. But it also begs the question, do people who pick up a bowl, see the price, and put it down again assume that it's handmade or that it comes from some supplier overseas? Because that could make a difference, I guess, in some peoples' minds. So in the future, Krystal suggested to me (always clever, that one!) that it might not be such a bad idea for sales like this to have some signs that can sit on my booth that say, proudly and boldly, that all pottery herein is one hundred percent handmade, by me, start to finish. But anyway: I had a great weekend. I think the turnout (and consequently sales) would have improved if we hadn't had our first taste of winter, but I was glad that things were clear and dry for both setting up and tearing down. Looking on the bright side. And I did well enough (sales) that maybe I can buy some Christmas gifts this year. Bolster the economy and all that. I'm going to try to get back into the studio sooner than later. I'd like to produce a full kiln of work to fire before Christmas, so if you're looking for something special, just le me know. Bolster MY economy and all that. In other news, I'm starting to see year-end lists or movies and books and music popping up, so maybe I have to get on the ball and share my favorite pottery-making music releases for 2012. Or something. We'll see. That's all for now. See y'all later, and thanks again to everyone who came out last weekend!